In today’s industry the green screen is largely used for special effects, allowing artists to portray their fantasy on screen. The process involved in creating this fantasy is called “chroma keying.” Chroma comes from color, and keying refers to the removal of a picture with the substitution of another. 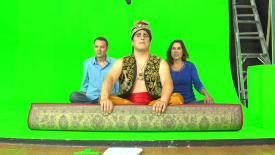 This is exactly what takes place when using a green screen. Green screens are a great tool for video production since you are able to select any appealing background without shooting directly on location. Not only is choosing the right background important to your video production, but the type of green screen is too. With the right green screen, one can better create a clean, accurate and creative shot. At Pixel Productions we use a painted cyclorama wall as opposed to a flat green screen wall. The coved cyclorama green screen offers much more flexibility and consistency during a green screen shoot. The cyclorama wall allows the cameraman to shoot from several different angles, which gives flexibility and movement to both the artist and cinematographer. This cannot be done on a flat green screen. Also, the cyclorama wall creates an “illusion of infinity,” meaning the setting and effects will exceed ones imagination. Properly achieving green screen effects is dependent on preparing the set properly. This includes Correctly lighting the green screen by dispersing light evenly on the green screen. This avoids creating shadows and avoids reflecting green light onto the subject. The cyclorama wall better allows for proper lighting compared with other types of green screens. Since light is able to reflect from all angles, we can avoid harsh shadows cast by the subject. Whether you use fabric or paint to make your green screen, it is important you ensure that it is clean and crinkle free to ensure the light reflects well. Paint is a convenient solution for dirt or stains, since you can simply apply another coat and the green screen will be as good as new. Just be sure the paint is the same color and is spread evenly to avoid difference in color. This is a small tip, but can save a lot of time and money. The cyclorama wall at Pixel Productions is a useful tool for photography and video production since it allows for creativity, imagination, and magic to happen on screen. Our green screen is both thick and sturdy, and can support many subjects, which works to serve the interests of Pixel Productions and its clients. If you would like to make use of a cyclorama wall, Pixel Productions, unlike other local studios in San Diego, allows for green screen rentals to help others convert their ideas into masterpieces. 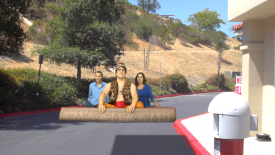 Green screens can be used for virtually anything, including corporate, commercial and fictional work. This multi-functionality is important as it gives flexibility and diversity to the director and cameraman to successfully capture the vision. So, go on. Explore, experiment, and create a magical and fantastical piece with the effects of the green screen. Interested in renting?